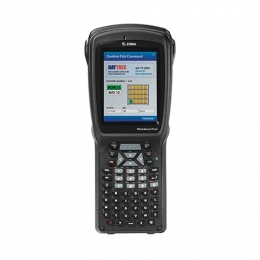 The Zebra Workabout Pro 4 mobile computer offers something unique uncompromising modularity. Thanks to its adaptive design, the compact mobile terminal is ready for the future, since upgrade are possible at any time - even during operation. There is no need to return the device. With a few simple steps you change the barcode scanner, expand the MDA with RFID, camera, GPS or switch to the practical pistol mode. The Workabout Pro 4 flexibly adjusts to increasing requirements perfect for future-oriented projects with variable areas of application. You therefore get exactly what it is you actually need. Adaptive design simply expand it with a 1D/2D scanner, RFID, pistol grip, GPS, etc. In addition to operation in warehouses, logistics, supply chains, etc. outdoor operation is no problem for the mobile terminal. It is IP65-certified against dust and water ingress, withstands multiple drops from heights up to 1.8 m and continues to operate smoothly in ice-cold surroundings down to -20C. The Workabout Pro 4 is available either as a standard version or as a practical compact version. Zebra power supply - Power supply, AC, 110-240 V fits for: Workabout Pro 4 quad docking stations. Zebra WAP4 cradle - Charging and communication cradle for Workabout Pro 4, USB, incl. power supply (PS1050-G1) and USB cable.